WAIST HIGH: Living, For A Very Long Time! Living, For A Very Long Time! Heaven 17, who head out on tour in November to celebrate the 30th anniversary of Penthouse and Pavement, are being featured twice in the BBC2's (already in progress) Eighties Season. From The Star/Sheffield Telegraph: As the BBC turns its attention to the '80s for a retro season of programmes it is only right the lens should fall on arguably Sheffield's most influential music period, writes David Dunn. Among the prime exponents of music that defined a generation is Heaven 17 - and the synth band formed by arts students Martyn Ware, Glenn Gregory and Ian Craig-Marsh gets two bites of the TV cherry. BBC2 will feature two shows directed by British TV director and writer James Strong, who gathered footage of the band's recent performances in South Yorkshire and interviews with people such as radio presenter Steve Lamacq and new electronic artists La Roux. The focus is on the then trio's seminal 1981 concept album Penthouse & Pavement, which from its artwork to its sound is viewed as a landmark '80s release. 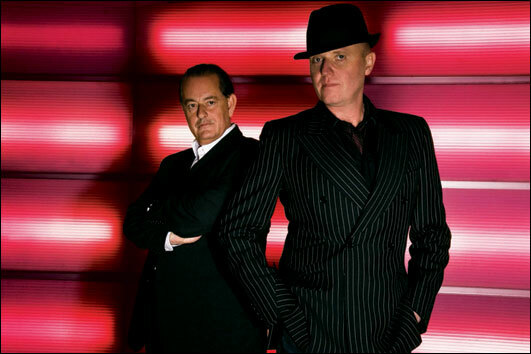 Heaven 17 Live In Concert (which aired for the first time last night) looks at the 30th anniversary tour in which remaining members Glenn and Martyn play the album in its entirety at the Magna centre in Rotherham. The Story Of Penthouse & Pavement (airing tonight) looks at the making of the record which featured the enduring hit "(We Don't Need This) Fascist Groove Thang." James Strong, who has directed episodes of Holby City and Doctor Who as well as the autobiographical documentary Elton John: Me, Myself & I, said: "The aim of the films is to tell the story of the band and the city - then and now." At the time the band were pioneers in terms of the technology they used to create the album. The early synths built in Sheffield were to change the face of popular music. We also explore how the influences of the steel city and it's industry were key in shaping the creative side of the band back then, but remain so today with steel being replaced by digital technology. "A young workforce who 30 years ago would have been forgemasters are now computer programmers." Martyn Ware adds: "Sheffield has always been a unique place. Sheffield allows and encourages creative talent to grow and develop. Just look at the musical heritage Sheffield has now." Both programs will be available on the BBC iPlayer for one week (UK residents only). Heaven 17 are currently: founding members Glenn Gregory and Martyn Ware, Asa Bennett, Billie Godfrey, Julian Crampton, and Joel Farland. The band will be supported on the 30th anniversary tour by DJ Mark Jones.